Think back to the time of Geocities, to the time of ‘Web 2.0’ designs and closer to home, with the “flat design” trend that’s popular now. Now, in 2013, the web industry is changing as rapidly as ever. New techniques, or ways of working, pop up every month, if not every week. This is completely true for trends in web design, for it’s often a particular design movement or idea that takes place, gathers some traction and then many other websites either adopt that design or steer clear of it. Either way, trends help us to observe a general direction that the design world might be heading in the months or years to come. There are a few advantages to trends in the design industry. First up, trends help us to more accurately predict how a movement might go in the future. Trends are often around for a reason and are important in helping us to understand how the design industry might be moving forward over the months ahead. Trends also help to keep everything fresh, as websites can often be spurred on to be updated by companies that have heard the latest buzzword and want to ensure that their website matches. Some trends aren’t necessarily to do with the design side of things though. For example, content-first design was initially deemed a trend (alongside responsive design, believe it or not!) as it was a popular way of working content into a design. This sort of trend is very welcome, as it can only improve the processes that we have when creating and designing for the web. But not all is good when it comes to trends. Although trends in one sense help to keep things fresh, it also means that websites can very quickly look or feel outdated, even if they’re only a year or two old. Designing a website to follow a trend can be risky business, in that way. Trends are also just that; trendy and popular. Many have issues with certain styles of design or trend, such as the “flat” design trend that’s rocking around currently, as they feel that it means that many websites look very similar or have too similar a style. Many feel that trends don’t push people to be more creative and are instead following a crowd, rather than being inventive and trying to create something unique themselves. There are many examples I can think of for current “trends”, and the reason that is in quotes is because to me, some of these are no longer trends, even though they can be considered to be. 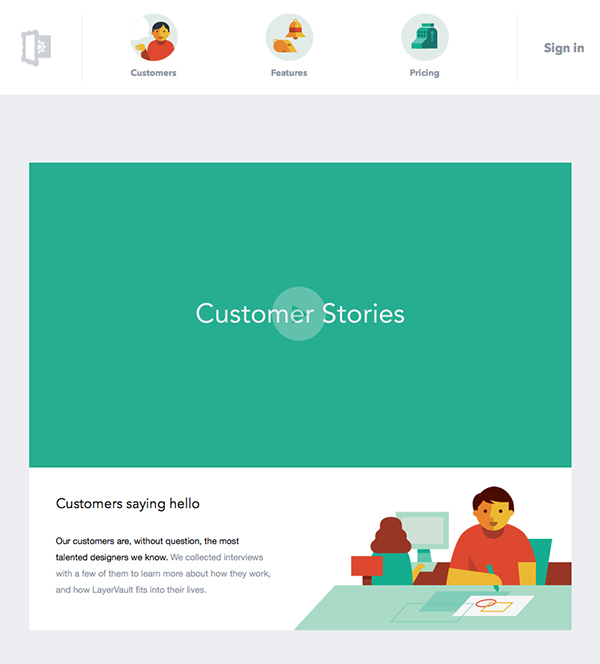 I prefer to call this ‘clean design’ myself, but we’ll go with the majority here who call it ‘flat design’. Flat design is just that; design that comes without extra depth embellishments such as textures, (obvious) gradients or 3d aspects and is instead replaced with a more “flat” aesthetic that is very clean and crisp. Big companies that are taking this approach are Microsoft (with Metro, Windows 8, Skype, etc), Apple (with iOS7) and Google (with all of their product designs). Flat design is really, in my opinion, all about embracing what the web is rather than trying to force almost-realistic, offline concepts onto the web. The Layervault website is beautiful, but definitely follows the “flat” trend that’s currently around. Arguably, they played a role in its conception. 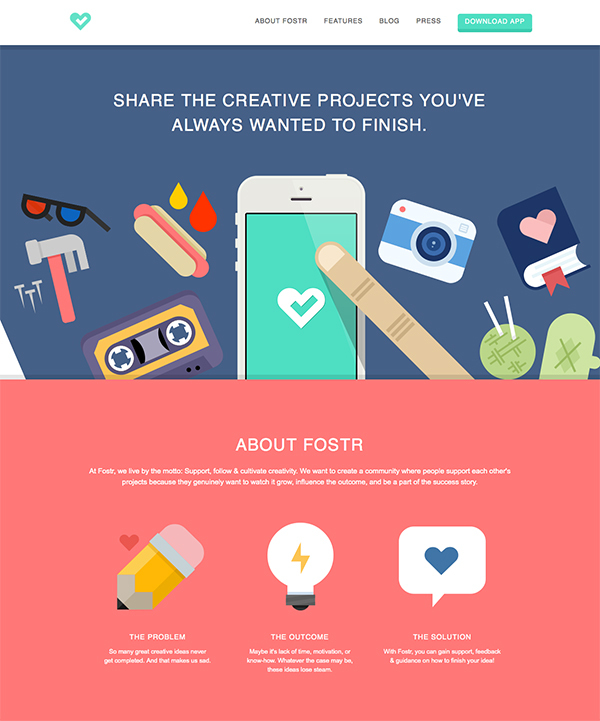 The Fostr website has some stunning illustrations on, though they’re definitely on the flat side of the trend than not. This is a popular trend that seems to have pushed through in the past year or so. Many websites choose to take the idea of working with a large, often full-width, header at the top of the website – but this time, it’s blurred to allow for text to be overlaid without any problem. This is just a small trend, but one that shows how quickly websites can start to look a little similar. However, with good photography, it’s a way that you can also show individuality and make a website a little more unique, particularly if you find a great way of making that area more interactive for your users. 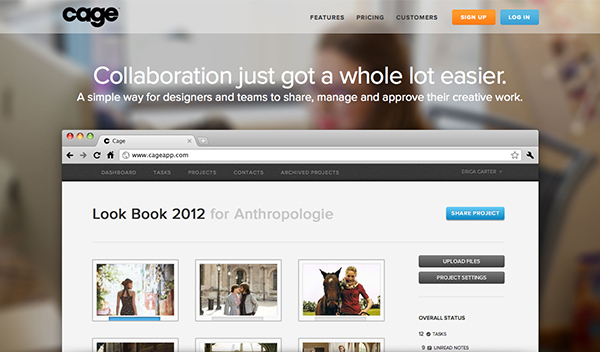 At Cage, they use a blurred photograph as a background header that has screenshots of the product shown on top. 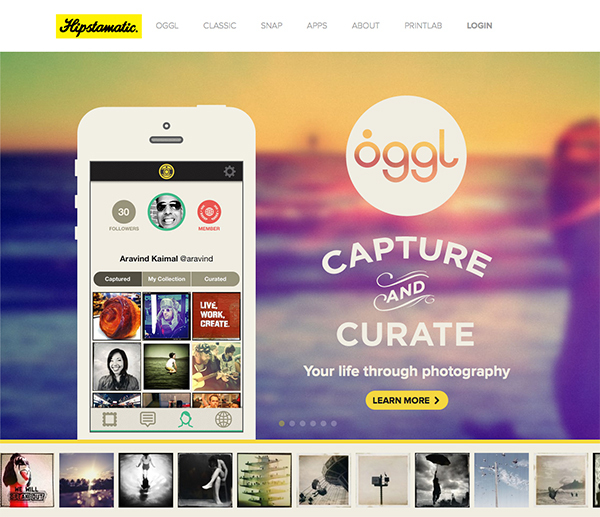 On the Hipstamatic website, blurred backgrounds are offset by beautiful colours and the brilliant interface of one of their apps. Initially this seemed to be just a trend, as many people described it to be one. However, with the way that our browsers are continually improving and updating, I doubt that this is one feature we’ll ever see go away. It’s really just an aspect of web design. With the introduction of CSS3 and @font-face, we can now express our design and brand messages through typography on the web in a way that we’ve never previously been able to. Whereas before this we’d only been able to use “websafe” system fonts, such as Georgia, Arial and the like, now we have options to use as many different fonts as we’d like – as long as they are web-font compatible. Our browsers are only ever moving forward, and the options that are offered to us as designers with the introduction of web fonts is massive. It’s expected that now, in this day and age, websites are more creative and web fonts are just one way to be able to do that. 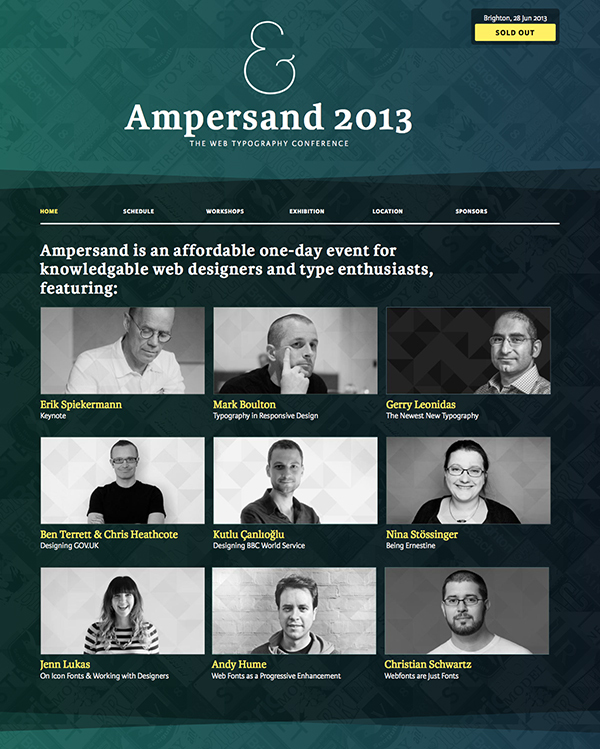 Ampersand (a conference on typography!) uses web fonts beautifully to present all the info about the speakers and more throughout their whole site. Another thing that is considered a trend (or at least a buzzword for 2012/2013, and therefore a trend to anyone outside of the web industry) is responsive web design. Although RWD is now something that has been around for a few years now, RWD is still in its relative infancy. I don’t reckon that this is a trend either, though. It’s been proven through all the research and stats that are shoved in our faces every day that usage of the web on a device that isn’t a laptop or computer is happening more and more. Responsive web design is here to stay, for at least as long as all these other devices stay around too. Although, like many people, I personally think trends are something that should challenge you to work differently and not follow the crowd, I still think that trends have their place and are relevant in some way. Trends give us a little insight into what the general public and world thinks in some way of the design industry and how it interprets what we do. Trends also help us to figure out what is popular and what works well, for there are many aspects of trends (even just little titbits) that might help you in future projects. And even if you don’t like trends, you can choose to ignore them and definitely carve your own, more unique, path in your own designs. This entry was posted in Applications, CSS, HTML5, Resources and tagged Application, Resources, trends. Bookmark the permalink.